You may have already heard, but something huge – a great big God moment – is happening in my life. On November 1, 2018, my first book is releasing! But here’s the thing, for my family and I this new book represents so much more than just the reaching of a goal and a living out of a dream. This book is about Selah. It’s about God redeeming what the enemy meant for harm. It’s about His unequivocal redemption from broken to beautiful. This is her story and this is the way God is using all she has gone through to make a difference in this world. I would be a liar if I told you I hadn’t been mad at God more times than one. As I’ve watched my girl fight demons and push through medical procedure after medical procedure, I’ve searched for the answer as to why He didn’t cut through the red tape and get her out of that orphanage and into our arms sooner. There isn’t really an answer, but I know His ways are higher than mine and I’ve learned to surrender my ways and trust in Him. Our sweet Selah may never live an independent life and go out and accomplish great big things in the way we all typically think of. But through this book, she is accomplishing more than we could ever imagine. I didn’t know what that victory would look like and I still don’t have the whole picture. But today I do know a part of that victory is in the sharing of her story. The story of how God adopts us. How God gives us hope. And how God will not ever allow His love or His plan to be thwarted. 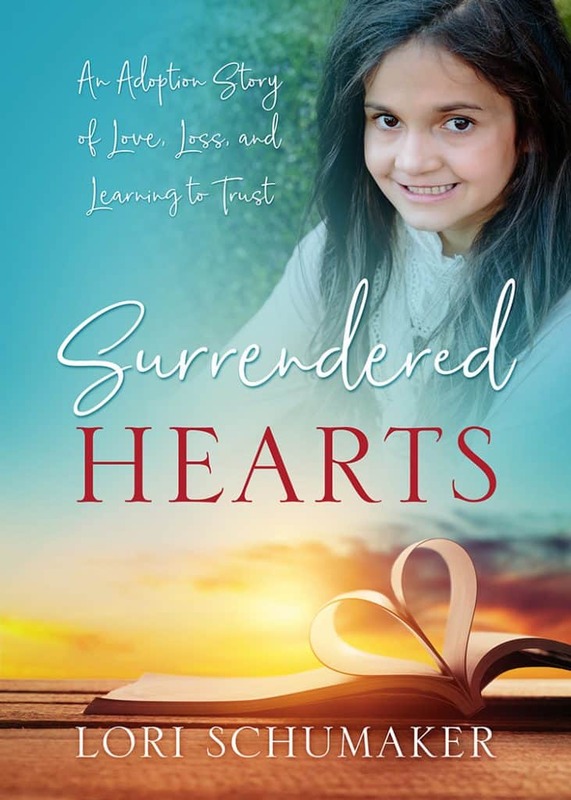 It is my hope that Selah’s story – Surrendered Hearts: An Adoption Story of Love, Loss, and Learning to Trust – does just that. That it advocates for adoption. That it spreads far and wide to bring awareness and hope to the millions of orphans around the world. And, most importantly, that it points to God, His miracles, and the hope we have in Him. Although the details are not finalized, my plan is to partner with the adoption agency that helped bring Selah home, All God’s Children, as well as the adoption/foster care ministry of my church by giving a portion of all my proceeds towards their orphan care efforts. Therefore, the further this book reaches, the more we can give toward orphans both local and around the world. I can’t do this without you. I need your help to share the message of Selah’s story. In a world saturated by books, websites, products, and social media, it is difficult to get a message to spread far and wide. But together, we can carry this message far and wide. So, would you consider joining me in launching this book? It’s really easy. You don’t have to be a blogger or know a million people. You just have to love books, have a heart for adoption and orphan care, and love Jesus! A FREE digital copy of the book that you can read before everyone else. An invitation to join an exclusive Facebook group of like-minded women. The group will run from October 20-November 20. 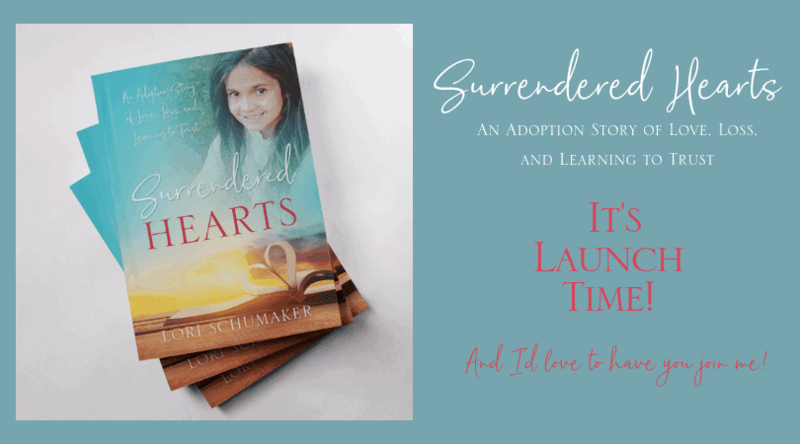 We will chat about the book and talk some of the inside story to adoption – both the journey to and the journey after we are home. You will get periodic updates regarding the book, resources such as images, tweets, and links to share, and some fun behind the scene happenings! I’ll jump in on some Facebook Live events, as well as Selah and the rest of the family. Here you will also get the first access to the extra resources I have created for all those who purchase the book. 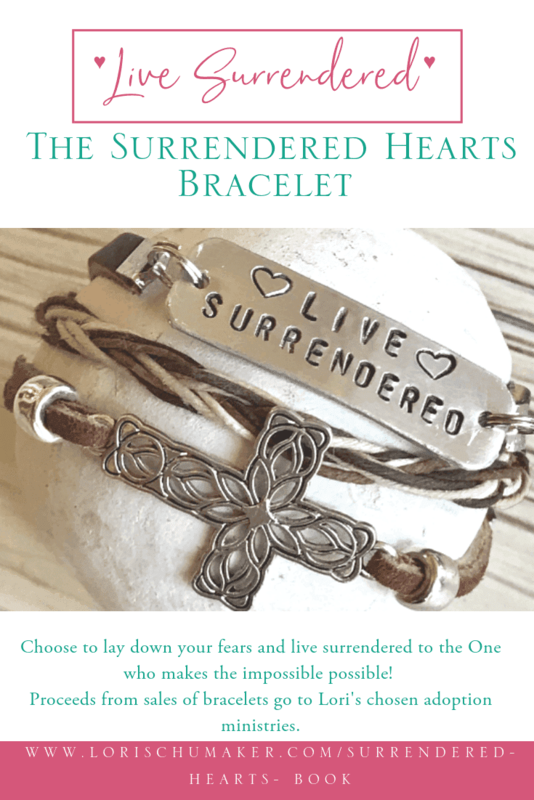 A chance to win FREE prizes like signed copies of the book, Surrendered Hearts bracelets (which are being made right now! ), and other fun surprises only those on the launch team will find out about! The endless gratitude of not just me, but of my whole family! Join me in praying for each step in this book launch, those making decisions along the way, and the very hands that will open the pages of the book. And I ask you to pray for my family and I. It seems whenever we step out of our comfort zones to follow where Jesus calls, the enemy launches an even greater attack. In order for us to remain strong and protected, we need your prayers. Join the Private Facebook Group upon invitation. Share provided images and links on your social media channels including Facebook, Instagram, Pinterest, and Twitter. Write a review on Amazon, Goodreads, Barnes and Nobles, and/or ChristianBook.com. Don’t worry, you will be shown exactly how to do this in the Facebook group. Tell your friends and family all about it. Tell your church/ministry groups about it as a way of promoting awareness for National Adoption Month. Gift a copy to someone you know in the dreaming of, in the process of, or has adopted. Send an email to your subscribers sharing our story and the book with links. Post a guest post written by me on your blog. If you are interested in this, I will give you topics to choose from so that you can find something your particular readers would be interested in. If you are interested, please sign up soon. Applications close October 10, 2018, at 12pm PST and spaces are limited. I will be emailing you individually by October 15th to let you know that you’ve made the team. So, if you are ready to join in the fun and make a difference for good in a world that needs it, click here to fill out the form! I thank you from the very bottom of my heart. I pray this book makes a difference and points others to Jesus and the hope we have in Him. And finally, I pray it encourages and convicts others to reach out in some way to the least of these – to the over 140 plus million orphans around the world. And friends, I pray God reveals Himself in a fresh new way to you and to each person that opens this book and begins to read our story. in an adoption or foster care agency. as an adoptive or potentially adoptive parent. as a foster parent or potential foster parent. in advocating for adoption, foster care, and orphan care. as a writer or blogger within an orphan care niche. in supporting another family in their adoption or foster care journey. Yes! I am committed to the process of sharing about the book, writing reviews, and helping to launch this book!